I’ve wanted to be a writer for as far back as I can remember. Emily Dickinson led me into poetry, and V.C. Andrews opened me up to fiction. My reading habits include poetry, short stories, long fiction and everything in between – romance to horror, sci-fi to suspense. If the words grab me, the story shall be read. Yet, when writing, I stick close to my heart with paranormal and horror. Why, you may ask, would a nice girl like me want to write Horror? I blame it on my fascination with fear and the authors who create it. These writers dig deep into their subconscious minds, pull out their biggest fears, and share them with the world. Expressing your fears on paper is by far the best therapy in the world. Fear is an invigorating emotion, perhaps even an addiction on some level. There’s no better feeling than sitting in bed and reading a book when every noise in the house starts to take on a menacing quality. As humans, we want to experience every emotion available. Fear, however, is a tricky one – a feeling best suited for vicarious participation. It’s such a strong desire among us that activities are created just for the thrill seekers – roller coaster rides, bungee jumping, and more. In the comfort of your home, you can enjoy the rush of blood pumping through your veins. All you need is a good horror movie, novel, or short story. Fiction offers the fear seeker a safe haven to enjoy the thrill. Unless, of course, you are one of those people whose imagination has the ability to turn into the real deal. As a writer, I find horror one of the most challenging genres. Everyone has different fears, and you do your best to touch as many as you can. Really, how many people are afraid of clowns? Such a notion never touched my mind until Stephen King pulled it off with such great talent. Evil dolls and little children are my fear igniter, not to mention mirrors, ghosts, demons, and that dang thing under the bed. Child’s Play presented us with evil trapped in a plastic doll. Many movies include the evil child. I get shivers just thinking about the cold, hard stares – not to mention the child zombies. When you look in a mirror, and your reflection doesn’t mimic you – what could be scarier than that! Bloody Mary isn’t necessary for mirrors to spook me. Demons and Ghosts go hand in hand with terror. What would you do if you came face to face with either? Run! I say run! Don’t hide in the closet – no telling what you’ll discover there. And don’t play videos when you don’t know what’s on them – The Ring. Halloween is a celebration of this fear and candy the icing on the cake. Haunted houses, one of my favorite aspects of the holiday, allow us to express the emotion in yet another safe environment. Have a Happy “Safe” Halloween, Everyone! TODAY’S GIVEAWAY: Cher Green is offering one digital copy each of her books Escape to Love and Seduced by Darkness. 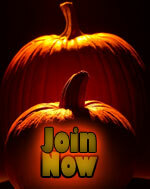 To enter post a comment in the section below or e-mail memoutreach@horror.org and put HH CONTEST ENTRY in the header. Winners will be chosen at random and notified by e-mail. Angelica hissed. Constance spun. The curtains whipped in the strong wind tearing through her house. Through the sheer drapery, moonlight pulsed, trespassing into her small living room. Hair on end, teeth bared, her cat arched. Constance’s heart echoed in her ears – it worked, her incantation had been a success. I get the “nice girl like you” question quite a bit myself, and I think you’ve touched on several of the answers here. What’s interesting to me is why some people (like most of us here) do like to be scared in a safe environment while others don’t. Are you planning on seeing any scary movies? I’m trying to work up the courage to go and see “Sinister.” It looks really terrifying. Bn100, Thanks. I enjoyed writing both of them. Michael, Sorry I didn’t see your comment. I will probably watch Sinister. Hiya, reading this made me think of my scariest moment. I awoke from a deep sleep, suddenly running outside as fast as i could to the parking lot of where i was living. I dont know how i accomplished it, but i ran straight thru a pile of rubbish of bricks and stuff. I want to understand, like a lot of other things that have occured in my life better.